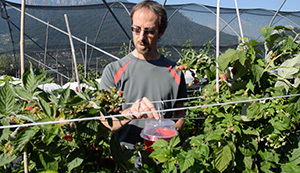 Dr. Alberto Grassi is a researcher at the Edmund Mach Foundation in Trentino, Italy’s prime fruit growing region. He presented the results of several years of field research on Drosophila suzukii at the International Soft Fruit Conference in ‘s Hertogenbosch. In an extensive comparison of different Drosophila traps Biobest’s Droso trap was the undisputed winner. Biobest’s R&D continues to zoom in on Drosophila suzukii, a serious concern for soft fruit growers. In addition to Droso trap and Dros’attract, Biobest is also working on a novel biological control agent against D. suzukii.